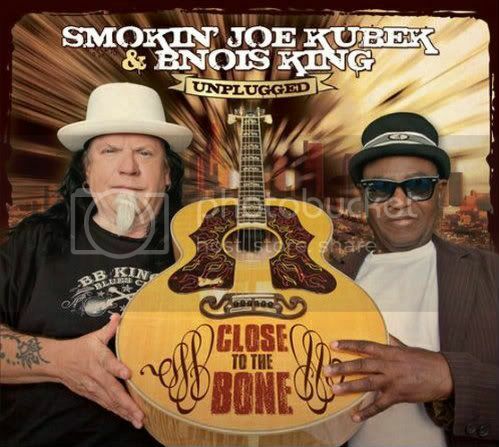 Smokin' Joe Kubek and Bnois King have wrapped work on Close To The Bone, the first new record for their new label Delta Groove records and will release it September 18. Close To The Bone is a 14-track set that follows their outstanding Have Blues, Will Travel, a record I still queue up with frequency. These two have been making music together for 20 years and it's one hell of a partnership. Kubek and King had a run of critically acclaimed records for Alligator Records before moving to Delta Groove for this release and the new label isn't all that's new about this record. The duo have made Texas roadhouse blues a signature part of their sound but they've (mostly) unplugged for this album. That would have disappointed me a little because of how much I love their high octane sound had I not heard them perform acoustic at the 2011 Blues Music Awards; this can still be a really great record even without Kubek's slash-n-burn style being powered by Marshall stacks. The move to Delta Groove means more than a label shift or releasing an album that changes direction. DG musicians tend to back one another on their respective records in the same way the legends of Chess Records played on each other's records. Kirk Fletcher, Shawn Pittman, Lynwood Slim, Bob Corritore, Big Pete, Jimi Bott, Randy Chortkoff, and more have all shown up to welcome King and Kubek to The Family and contribute to the record. I have an uneasy relationship with my birthday. The thought of growing older is only slightly more appealing than the thought of, well, not. New music from Smokin' Joe Kubek and Bnois King will give me something to embrace without reservation.